As an expat that has spent nearly four years in South Korea, I’ve come to develop a fondness for Korean cuisine. Some dishes were instant hits for my overzealous taste-buds; while others were certainly an acquired taste that developed over time. 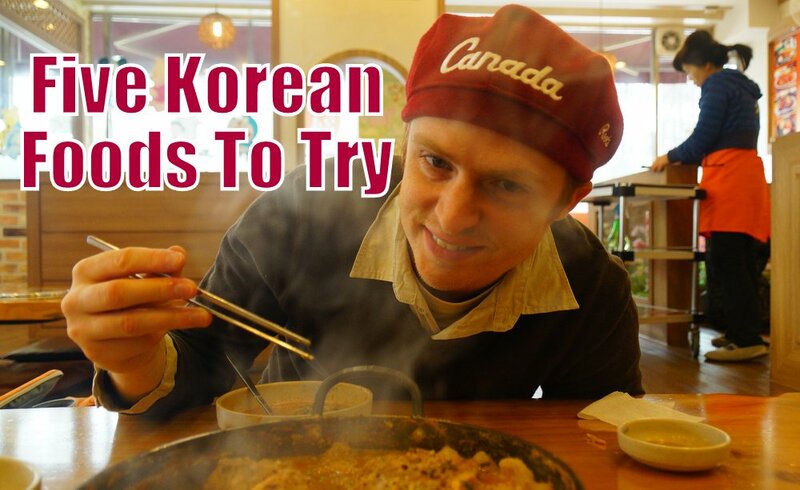 In recent months I’ve been churning out Korean food related videos with my girlfriend Audrey Bergner. I’ve been guilty of not sharing many (maybe not any!) of them here on Nomadic Samuel. The time has come for that to change as I burst out of the closet and reveal my true nature as a foodie. I’m going to be presenting a series of Korean food related posts. This first one highlights five dishes I recommend you should try whether you’re visiting Korea or have access to Korean restaurants back home. Without further ado here they are! Sitting down at a traditional Korean restaurant for a stone pot set lunch feast (한정식 韓定食) is an experience every foreigner should have when visiting South Korea. This is the type of Korean meal that will make you feel like royalty (or at the very least a distinguished guest of honor) as non-stop carts wield out dish after dish of Korean meats, vegetables, fish, soups along with a plethora of savory side dishes. For this particular meal we decided to come on Valentine’s Day as a healthier alternative to stuffing ourselves with copious amounts of chocolates and candies. Our favorite dishes included Korean style jeon (also known as pizza), bulgogi (marinated beef strips) and japchae (sweet potato noodles mixed with vegetables). We devoured everything feeling pleasantly full afterwards. Overall our meal was excellent value as we paid 26,000 Korean Won (roughly $25-26 USD) for the entire feast. This particular meal holds a special place in my heart given that it was the very first thing I ever ate in South Korea. A Korean friend picked me up from the airport and took me to the traditional area of Insadong, Seoul where I gormandized on Korean pancakes (aka as Korean pizza) 파전 for the first time. Made out of green onions as its prominent ingredient, the dish literally means ‘green onion’ in Korean which is mixed with a batter of eggs, flour and often seafood ingredients. It’s the perfect kind of food to have on a rainy day or when you hike a mountain. As far as drink pairings are concerned, one can’t go wrong with fermented Korean rice wine ( Makgeolli 막걸리) which has a murky white consistency. This is a great value meal as our large Korean pizza and rice wine came to only 13,000 Korean Won (roughly $12-13 USD). This particular Korean dish is the perfect kind of hearty stew to help ward off a frigid Korean winter day. The soup/stew consists of pork spine, vegetables, sesame seeds, potatoes and chili peppers. It’s a do it yourself type of Korean meal where all of the ingredients are served in the pot. The best part of the meal, was hearty broth that was spicy and very flavorful. Along with cutting, stirring and removing meat from the bone one also serves their own portion on a small Korean bowl. This isn’t the cheapest meal coming in at 25,00o Korean Won (roughly $24-25 USD) but is a great communal type of dish. In this travel video we visited our favorite Korean restaurant in my old small neighbourhood of Anseong, South Korea. 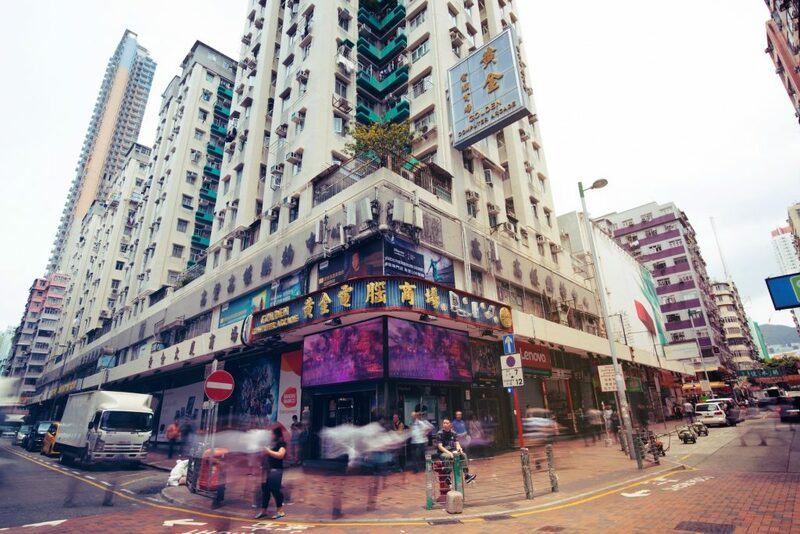 The place is just a humble hole in the wall style of family restaurant in the basement of small commercial building. Located next to a Korean butcher shop and Korean grocery store we didn’t even know the name of the restaurant until we discovered it on a sideboard hanging from the roof. For our lunch we are treated to a delicious meal of bibimbap (Doltsot Bibimbap – Korean stone pot mixed rice) and Soon Dubu Jigae – a tofu based soup/stew. 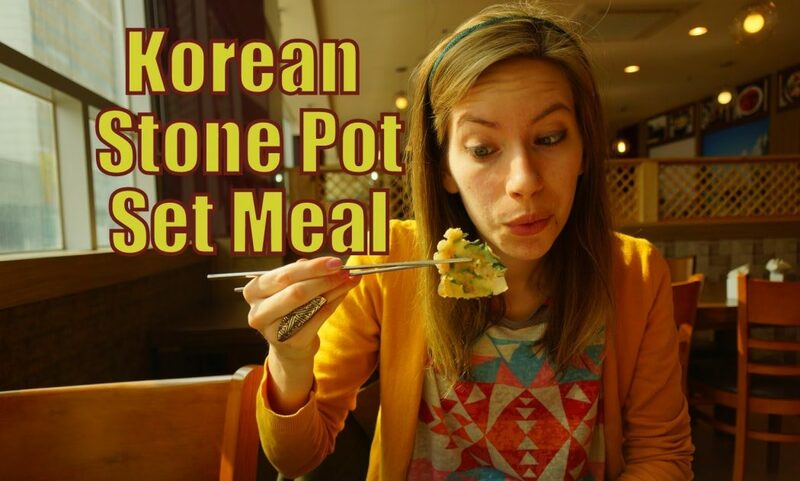 We show you what it is like to eat at a Korean traditional restaurant with no chairs. The side dishes were amazing and we ended up being completed stuffed. This meal only cost 12,000 Korean Won (roughly $11-12 USD) and we ate there so many times the Korean lady (we called Mama) didn’t even have to ask what we wanted to order. The Korean version of a fast food joint is a much healthier type of restaurant than its western counterpart. It’s the kind of place where you can come to order various kinds of noodles, rice rolls, fried rice, pork cutlets and others types of Korean cuisine. This is the type of meal where you won’t likely spend more than 4,000 to 5,000 Korean Won ($3.75-$5.00 USD) for a meal. In this particular video we visit on of Audrey’s favorite local eateries in Dongbaek, Yongin, South Korea. We order Kimchi Fried Rice and Spicy Tuna Soup (김치볶음밥 & 참치찌개) two familiar dishes we both love. Wow, the foods certainly look extremely delicious, especially the Korean pizza. Can’t wait to drop by a Korean restaurant now and feast away, haha! I enjoyed the article, especially since I had lived in Korea for over 6 years. To add to the list I’d suggest bbq pork (삼겹살) as this was I introduced to family and friends when they visited. Nice work! Those look delicious. You two must be experts on Korea by now? Thanks for sharing Sam! I have only tried Korean food once…. but it was in Denmark. So I don’t think it counts! I am a big foodie and next time I am in Korea I will try the stone pot set lunch feast. Thanks Chaa, that’s the one I recommend the most! Awesome post on Korean Foods. The Kimchi Fried Rice and Spicy Tuna Soup is something I would like to try.